Extensive fabric webs, timelessly arranged, link decorative sun shading and extraordinary functionality. sundrape® offers various possibilities: free movable, operation by cordpull, rod or electric drive. Please find a large choice of design in our substantial collections – fabrics for almost every demand, from private areas to computer work places. Due to different types you can make use of sundrape® panel curtains in a great variety. With this product you lay stress on design in modern styled areas. Different possibities to arrange stack and moving direction invite you to realize your ideas. 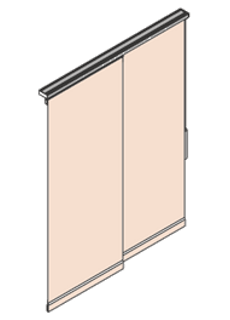 sundrape® panel curtains: a user-friendly system which is always an optimal solution either in front of windows or used as partition. 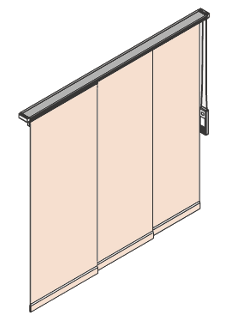 The rugged technique of sundrape® panel curtains guarantees long-lived function. Draperies do not have a lateral seam, because they are being sealed already during the cutting. Hence the fabric keeps its high-grade look for many years. All components and end caps are made of first-class, white coloured plastic. Roller bearing elements care for smooth running. 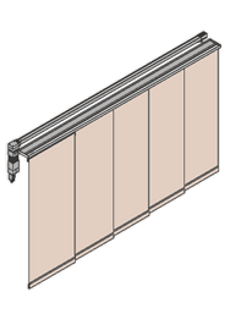 Number and arrangement of the 2 to 5-track aluminium rails can be set and combined individually. 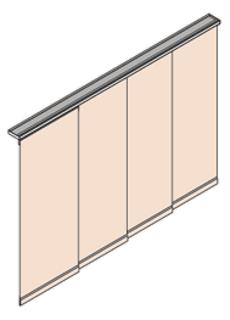 So it is also no problem to realize blinds of a large width.